Prosecutors last week charged alleged MS-13 gang members Elmer Gilberto Santos Contreras, above, and co-defendant, Anthony Gutierrez-Mesa, not pictured, murdered an 18-year-old Greenlawn resident in 2016 and left his mutilated body in Greenlawn Park. 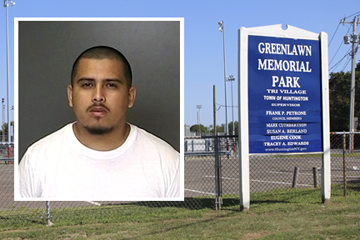 Two alleged-MS13 gang members have been charged with the murder of an 18-year-old whose mutilated body was found dead in a Greenlawn park nearly two and a half years ago. Suffolk County District Attorney Tim Sini announced last week second-degree murder charges had been filed against Elmer Gilberto Santos Contreras, 23, of Roosevelt and Anthony Gutierrez-Mesa, 23, of Valley Stream for the killing of 18-year-old Estiven Abrego-Gomez of Greenlawn in August 2016. Abrego-Gomez’s body was discovered on the Little League field in Greenlawn Park at the intersection of Pulaski Road and Broadway with “significant sharp force injuries and blunt force trauma,” according to the medical examiner’s report. The violent murder “hit the Greenlawn community very hard,” Sini said. “The motive here is one that we’ve seen numerous times, particularly by MS-13, where gang members use violence to retaliate against rival gang members,” Sini said. Police had been reluctant to officially link the murder to MS-13 or gang violence. In an August 2017 interview, then-Police Commissioner Sini confirmed to The Long-Islander the murder was “gang related.” It was the first time law enforcement confirmed gang involvement in the year-old murder. “For the past two and a half years, the Suffolk County Police Department’s homicide detectives have relentlessly focused on finding justice for Estiven Abrego-Gomez and to hopefully provide some closure to his family,” Hart said. Contreras, who prosecutors said is an El Salvadorian citizen, was in ICE custody awaiting deportation proceedings in Virginia, but was brought back to Suffolk County by detectives for a court appearance last Thursday. Suffolk County Court Judge Philip Goglas ordered Contreras held without bail. If convicted, Contreras faces 25 years to life in prison. An attorney for Contreras did not immediately return a request for comment. Prosecutors said Gutierrez-Mesa is currently in police custody in Virginia and will be arraigned at a later date.